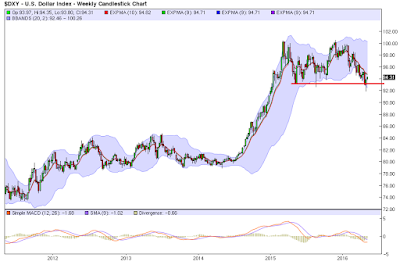 My Weekly Indicator post is up at XE.com. Rail traffic remains absolutely awful, and shipping isn't great either. Aside from that, almost all signs of the shallow industrial recession are disappearing. At least if this week's data releases on producer prices and manufacturer, wholesaler, and retail sales can be believed, the data series that go back 70 and even 100 years that have reliably signaled the end of a slowdown or recession, did so again. The post is up at XE.com. 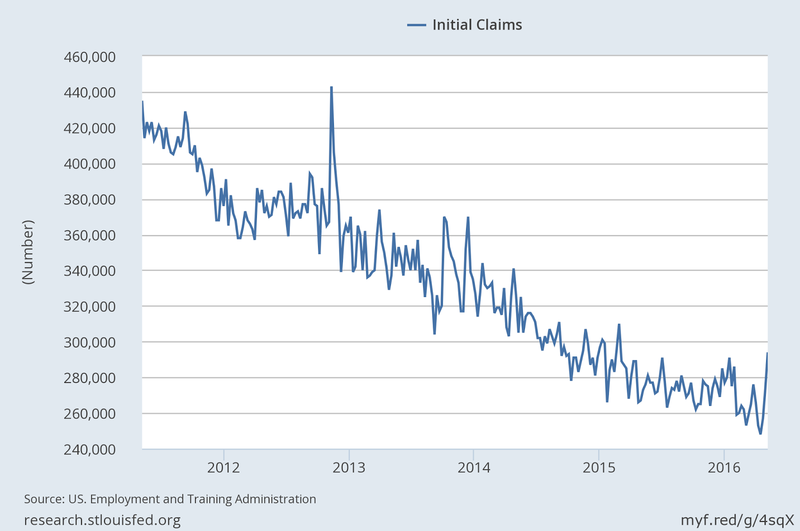 Meantime, the year-over-year change for claims in unadjusted terms looks troubling. New filings rose nearly 8% last week vs. the year-earlier figure before seasonal adjustment—the second straight weekly increase and the biggest annual jump in more than two years. One bad week (or two) hardly constitutes a definitive signal for this leading indicator, which is notoriously volatile in the short term, and so it’s wise to reserve judgment for a bit. But the case for optimism is on a short leash until further notice. 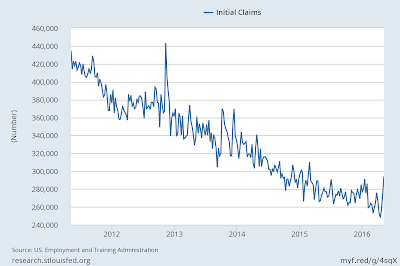 It seems that we’ve run out of room for further disappointments in the weekly claims data. 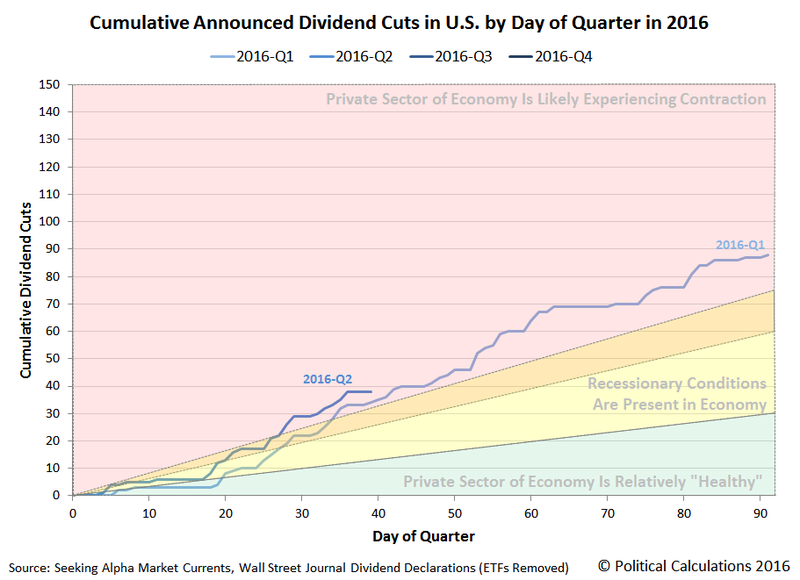 Today’s release may prove to be an outlier with minimal relevance for the US business cycle. But that explanation will melt faster than a snowball in August if next week’s numbers push new claims above the seasonally adjusted 300,000 mark for the first time in more than a year. Demand growth in the first three months of 2016 was 200,000 barrels a day higher than earlier anticipated at 1.4m b/d, the world’s leading energy forecaster said on Thursday, with India responsible for almost a third of the upward revision. 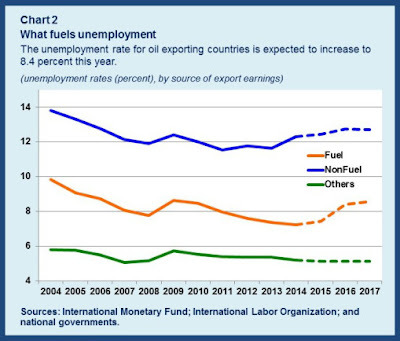 Although the IEA left its forecast for global demand growth unchanged at 1.2m b/d for the year, it said the risks to future forecasts was to the upside, citing gasoline demand growth which it said was growing “strongly in nearly every key market”. 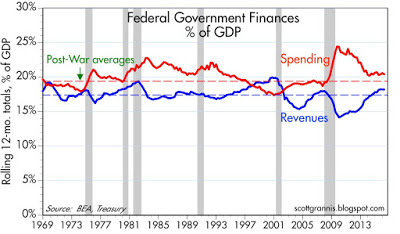 On a rolling 12-month basis, the federal budget deficit hit a peak of almost $1.5 trillion in February 2010. From that dizzying height of just over 10% of GDP it fell steadily for six years, hitting a low of $402 billion last February, a mere 2.3% of GDP. It's unlikely to get any lower than that, unfortunately, unless and until we see stronger economic growth and/or significant reform to entitlement programs. For the foreseeable future, the budget deficit is likely to get bigger; it's already jumped to just over $500 billion as of last month. There are several culprits: weaker economic growth, weaker tax collections, and a pickup in spending. Time To Short the Automakers? The following investment idea is VERY RISKY. ACCEPT THE FACT YOU COULD LOSE YOUR ENTIRE INVESTMENT. If this makes sense to you, buy in-the-money puts. Helping increase Fiat Chrysler’s April sales were some of the highest incentives in the industry of nearly $4,000 on average per vehicle sold, up 25.1 percent from a year ago, according to TrueCar. That compares to a 14 percent increase at GM, with $3,909 in incentives, and a 24 percent increase at Ford to $3,423. The industry on average was up 13.3 percent to $3,021 in incentives per vehicle sold, TrueCar reports. Increased incentives eat into company profit margins. They also signal consumers need increased coaxing to make the sale. 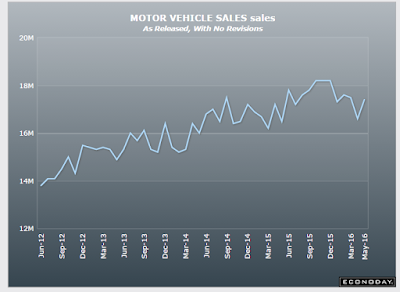 With the exception of the spike in 4Q15, this data series has moved sideways since September 2014. 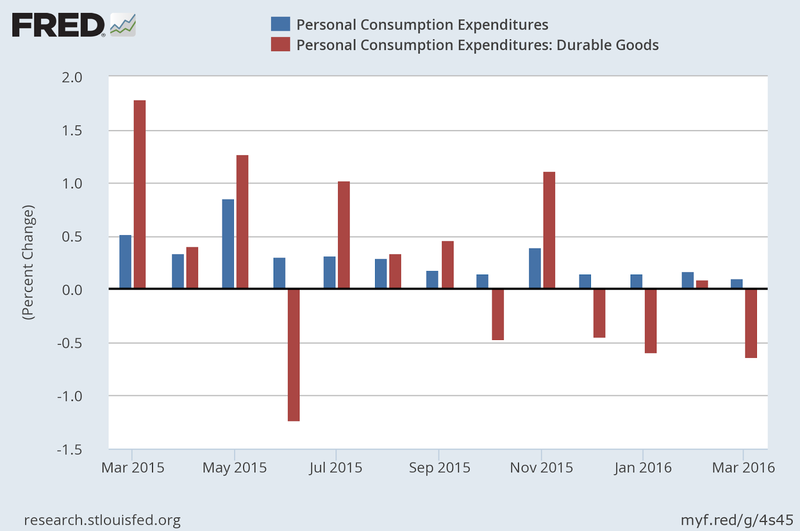 Above is a 1-year chart showing the monthly percentage change in personal consumption expenditures (("PCEs"; blue bars) and PCEs of durable goods (red bars). Monthly PCEs have slowed: the last 4 readings are barely positive. 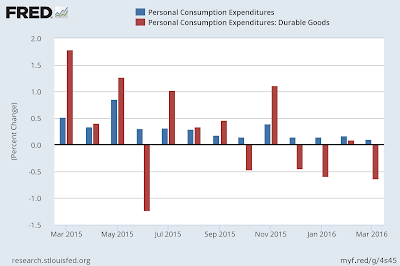 Durable goods purchases contracted in 4 of the last 5 months. 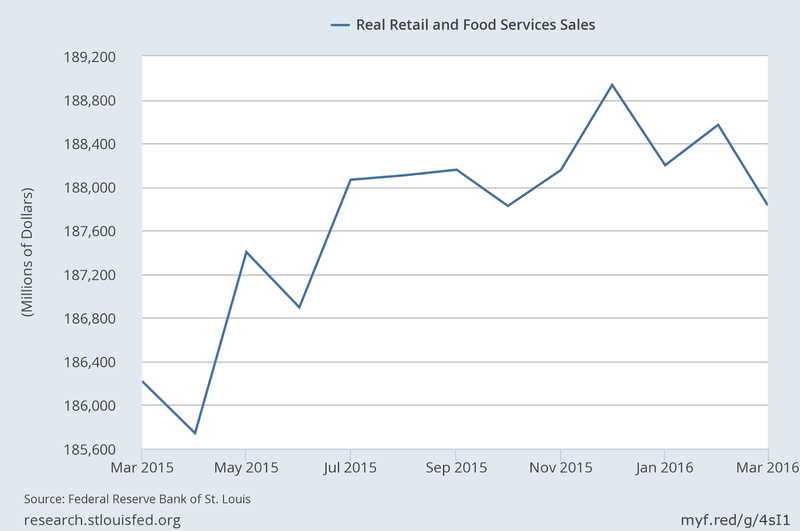 Clearly, consumers are slowing their purchases. And this is occurring within a broader slowdown in economic growth and slightly weaker employment gains. Both have similar technical characteristics. For the last year, each has encountered strong technical resistance at the 200-day EMA. Both have declining momentum. Most importantly, both are right at short-term technical support. Toyota Motor is bracing for its first profit decline in five years as the stronger yen and growing recall costs threaten to crimp its growth prospects. The world’s largest carmaker had enjoyed a steady period of record profits on the back of the yen’s fall since Shinzo Abe became prime minister in 2012. 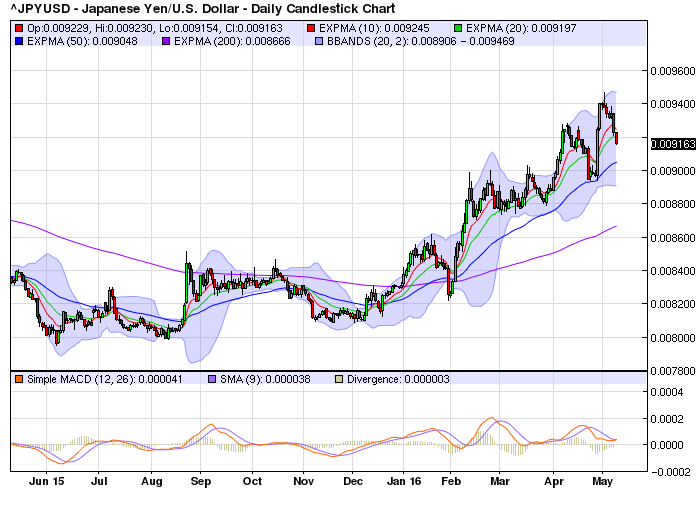 But that trend has reversed recently as the company was hit by the rising yen, costs to recall and replace Takata-made airbags and disruptions to supply chains caused by earthquakes in southern Japan last month. For the fiscal year through March 2017, Toyota forecast a 35 per cent year-on-year fall in net profit to ¥1.5tn ($13.8bn), below analysts’ consensus forecast for a profit of ¥2.2tn. 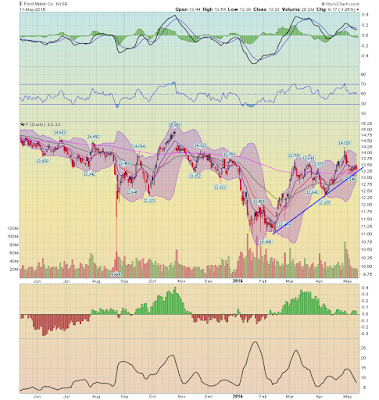 The pieces have lined up nicely for shorting. But please read the caveat at the top of this article. [T]he median wealth of people in the 55 - 64 cohort is something like $200,000 - but a non-trivial percentage of middle class workers ultimately reach this milestone [of having $1 million in wealth]. ....If you really and truly want to make a dent in the persistent employment problem facing younger workers, allow anyone age 55 or above to buy into Medicare. Charge them annual premiums equal to what they would have to pay into Medicare at their same wage or salary until age 65 if they continued to work. You would be amazed to see how quickly Boomers can still move, cleaning out their offices and cubicles, when properly motivated. And then younger workers could move right in. [A]s she tries to clinch the nomination, Mrs. Clinton is moving to the left on health care and this week took a significant step in her opponent’s direction, suggesting she would like to give people the option to buy into Medicare. “I’m also in favor of what’s called the public option, so that people can buy into Medicare at a certain age,” Mrs. Clinton said on Monday at a campaign event in Virginia. Hey, I was just doing my part for the Progressive Agenda. Nice to see the Establishement come around. Hillary, can I send you my paypal account information so you know where to send the check? P.S. to the humor-impaired. Yes I know the public option has been around for a long itme. But every once in a while, it's nice to think you may have caused a significant ripple in the pond. 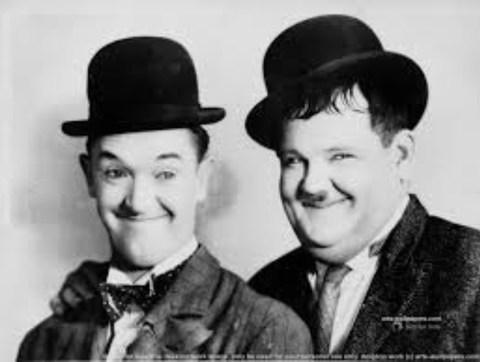 Yesterday, I read that Donald Trump asked Larry Kudlow and Stephen Moore to "tinker" with Trump's latest tax plan. I'm surprised anyone takes Kudlow seriously anymore. And Heritage sold their soul a long time ago. On a more serious note, for the first time in my life, I am terrified of what might happen. Trump has no depth and no understanding of nuance. But at least I can laugh about it. 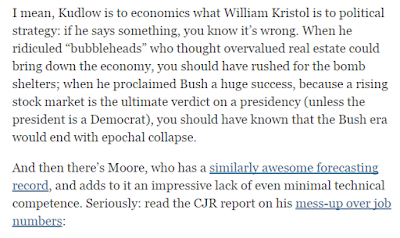 And thanks to Krugman for making that happen. 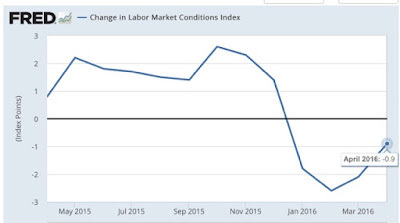 /this week we have two follow-up reports on the labor market: the Labor Market Conditions Index, and the JOLTS report. This is another small addition to the evidence that 2017 might be a poor year. It also suggests that monthly job gains, that have already decelerated from a 225,000 rate, will continue to do so. In other words, export more reports of 1xx,000 to come. But at the same time it is nowhere near as negative as it has been in the past at the onset of recessions. 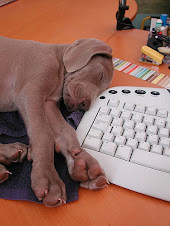 Now let's turn to the JOLTS report. While it is an extremely useful dissection of the labor market, it has only existed for 15 years, and thus includes only one full expansion. The pattern from the last expansion was: first, hires peak. 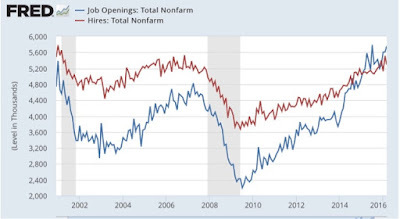 Then, openings peak. Openings had been rising faster than hires, which are have been barely positive. Until two months ago, when hires soared to a new all-time high, as shown in the first graph above at far right. 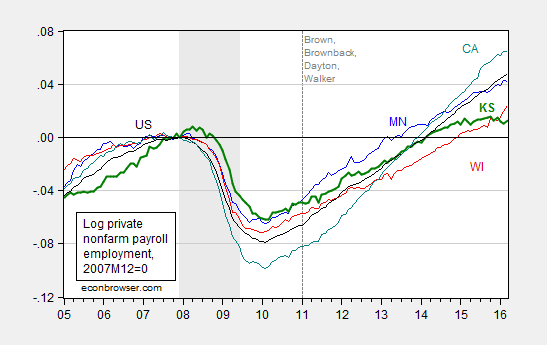 Since then, the upward trend in hires has remained. This means that workers were confident enough in their prospects to voluntarily leave their jo bs. Note that layoffs (blue) remained low. 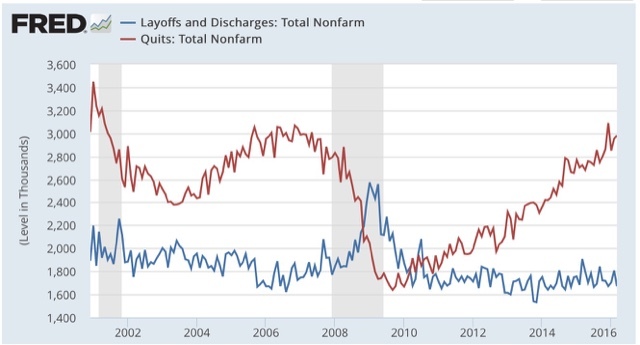 Needless to say, the increase in voluntary quits is a significant positive. 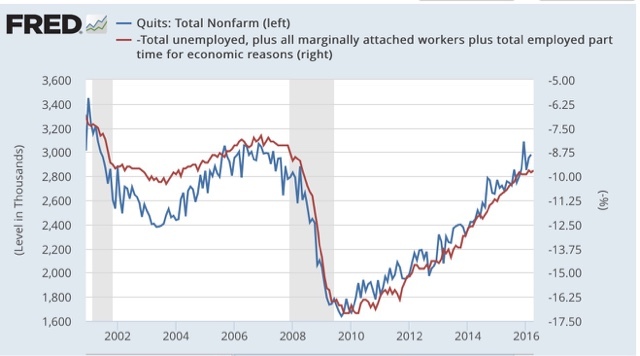 For every level of underemployment over the last 3 years or so, there have been more Quits than occurred during the last cycle -- supporting the hypothesis of "pent up demand." 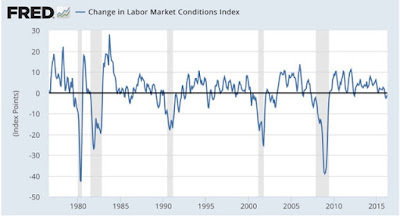 Taken together, the LMCI continues to suggest a maturing but not expiring expansion, and this month's positive JOLTS report suggests that job growth has a ways to go. 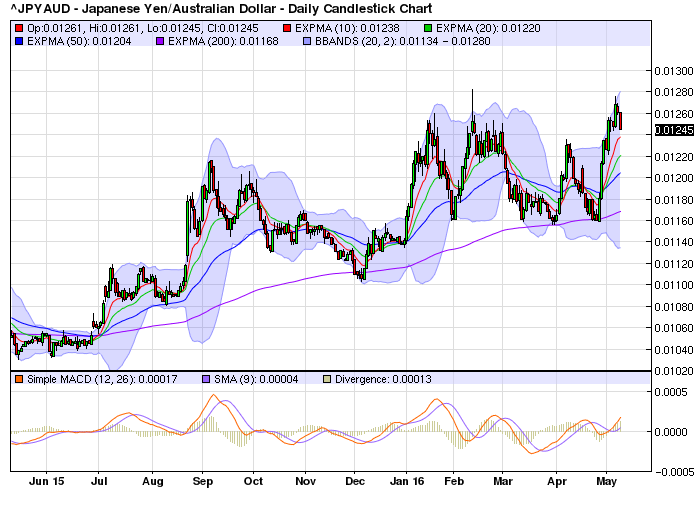 The top chart is the yen/Australian dollar. 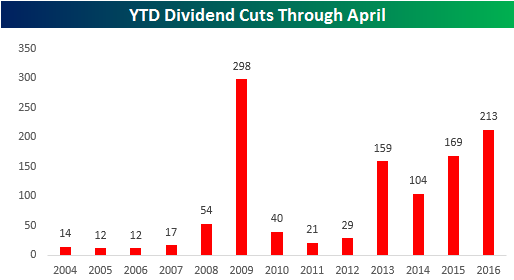 The chart increased ~21% in the last year. 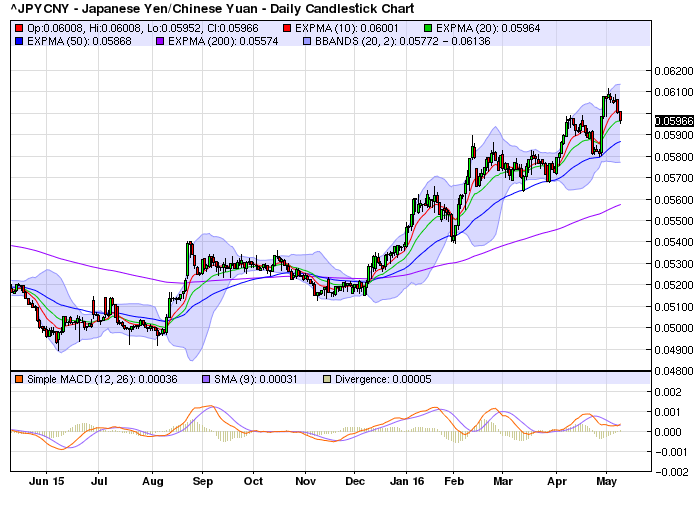 The middle chart is the yen/yuan, which increased ~18 last year. 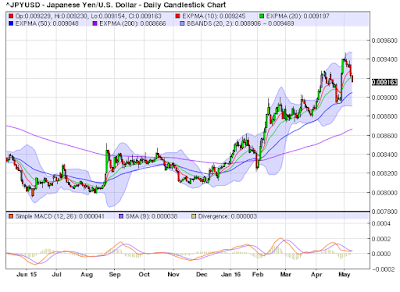 the bottom chart is the yen/dollar, which is up 12.5% over the last year. Charles Evans, president of the Chicago Fed, also said he would welcome a temporary overshoot in inflation to lift consumer price growth up to the Fed's longer-term target of 2 percent and raise overall inflation expectations from current low levels. 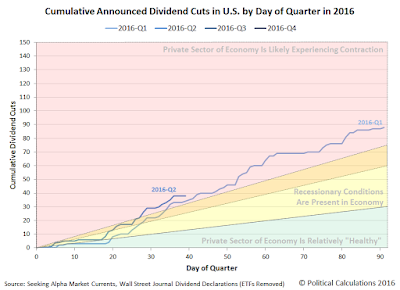 "While the fundamentals for U.S. growth continue to be good, uncertainty and risks remain. In my opinion, the continuation of 'wait and see' monetary policy response is appropriate to ensure that economic growth continues," he told a conference in London. Intact Financial Corp. may post insured losses of as much as C$1.1 billion ($850 million) from the wildfires in Alberta, which could dent the Canadian economy harder than Hurricane Katrina hit the U.S. Intact, Canada’s biggest property and casualty insurer, said the damage claims will lead to net losses of C$130 million to C$160 million, or as much as C$1.20 a share, according to a company statement Monday. Jaeme Gloyn, an analyst with National Bank of Canada Financial, estimated the C$1.1 billion figure based on the company’s per-share data. The Toronto-based insurer had net income of C$147 million in the first quarter. 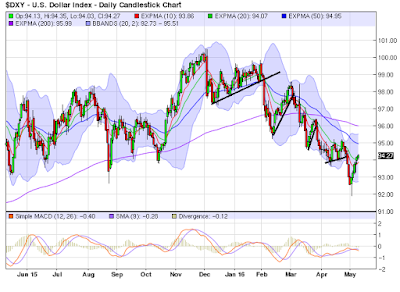 The daily dollar chart is bearish. 1.) 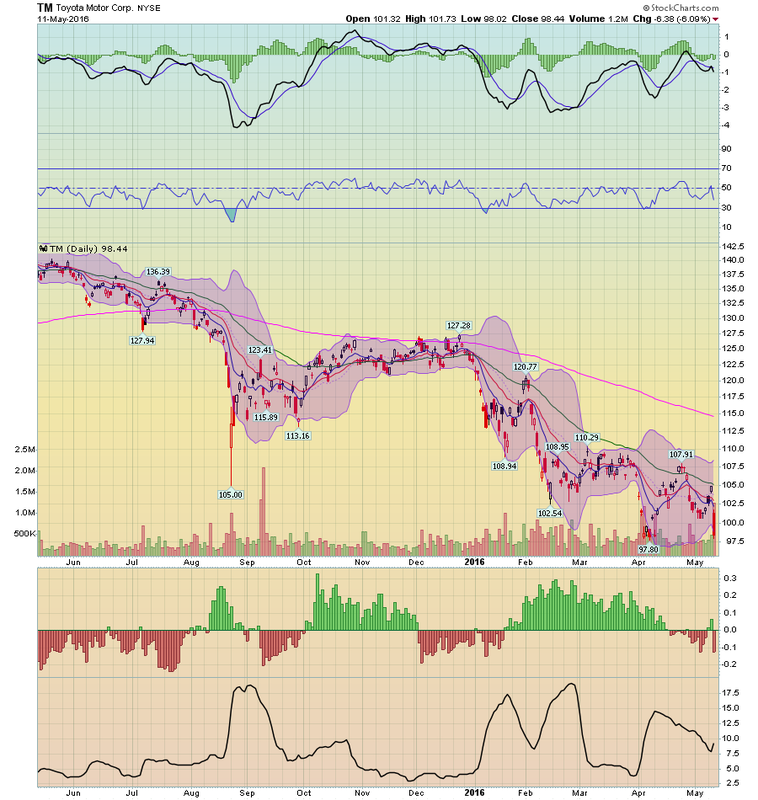 The 50 and 200-day EMAs are moving lower. 2.) The 50 day EMA is below the 200-day EMA. 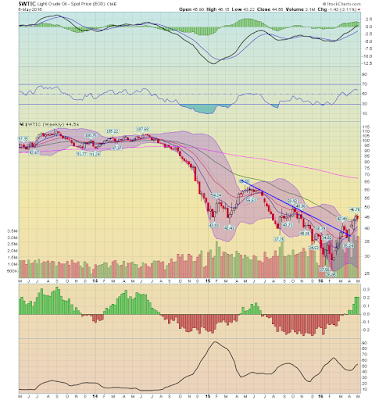 The shorter EMA will pull the longer EMA lower. 3.) Prices sold off 6 times since December 2015. 4.) Prices have been in a "lower low, lower high" pattern since December 2015. 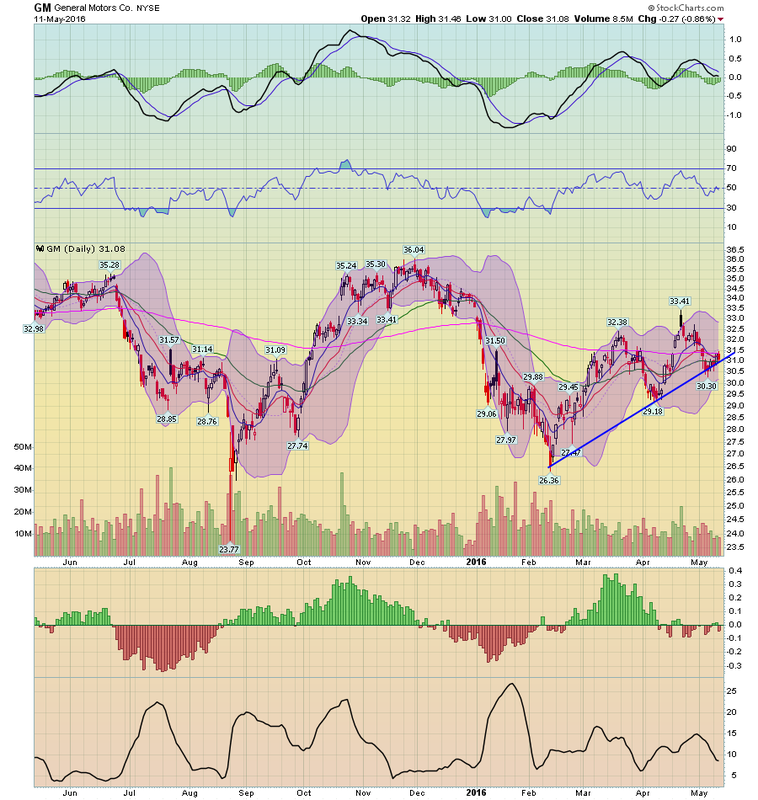 Prices are right at long-term technical support around the 93 level. There is plenty of technical real estate between 93 and the previous ~85. There is no current reason to think the dollar will meaningfully rally. Instead, expect technical counter-rallies. And Friday's employment report placed the Fed on the sidelines for at least the next meeting. Several days ago, Trump floated the idea that the U.S. should ask it's creditors to take a haircut on their respective U.S. debt holdings. Below is a smattering of commentary on the idea. I would add this point: a central idea in international finance is the idea that U.S. debt is riskless. Analysts use U.S. interest rates as the risk-free rate of return. Trump's idea would eliminate that assumption, which would throw a monkey wrench into international finance as we know it. This is, quite literally, one of the dumbest ideas I've ever seen floated. Period. His “very good brain” doesn’t seem to be firing on all cylinders here. Let’s unpack these comments because they’re both extremely wrong. 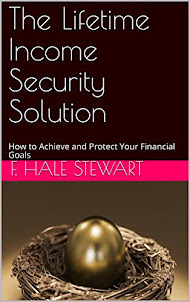 First, if interest rates rise by 2, 3, 4 points then what happens? Wait, no, I am being stupid now. Sorry. The right question is, WHY would interest rates rise by 2, 3 or 4%? The only plausible case for rates rising that much is if the US economy is booming and the Fed is raising rates in an effort to slow the boom. So, Trump is constructing a totally false scenario in the first place. If rates are rising then America is great again and we certainly still have a country. Perhaps he thinks we’re Greece where interest rates rose due to solvency fears. I don’t know if that’s what he’s inferring, but if he is then he doesn’t understand the solvency dynamics of the US government within the scope of the global financial system. I’ve explained that concept in excruciating detail many times over the years. See, Why the USA isn’t Going Bankrupt & Concerns About the National Debt. And if he thinks today’s environment looks anything like the 1970’s then he’s still way off the mark as today’s environment resembles the 70’s in almost no way. See, 3 Reasons Today’s Environment is not like the 1970’s. But let’s go with this notion even though its causation is misleading. If interest rates rose by 4% what would the economic burden be? Well, the average maturity on US government debt is roughly 5 years.¹ 5 year notes pay about 1.3% today, which is about what the US government pays on average for its debt. 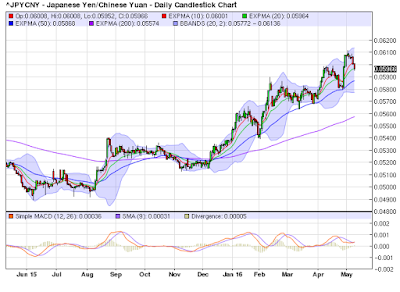 If rates rose by 4% then it’s likely that 5 year notes would offer a slight premium. Let’s just say 5% for fun. What happens to the budget deficit? Interest payments would jump to about $950B per year which would bring the deficit to about 1.4T or 7.7% of GDP using today’s figures.² That sounds unpleasant, but it’s not even close to the 10% deficit we experienced during the financial crisis and nowhere near the 30% figure we saw during WW2. We still have a country after these experiences if I have my history right. US Treasury bonds have very low interest rates because investors are extremely confident they will be paid in full, even in poor economic conditions. Trump — by openly saying that he would keep partial payment on the table as an option — could spark a crisis in the Treasury markets if he became president. Investors would cease to see Treasurys as a safe asset, and they would demand higher interest rates in exchange for risk. This, of course, is a terrible idea, and a good reason for Republicans to hesitate in coalescing around Trump. 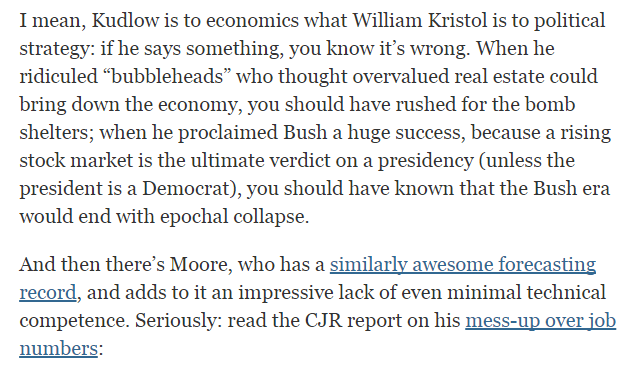 Do they really want manufactured economic crises to be part of the Republican brand? 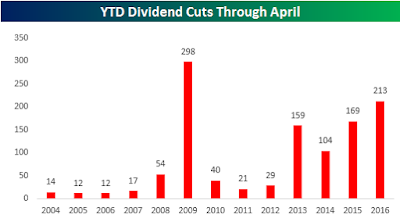 Well, judging by their behavior during the 2013 debt-ceiling crisis, some of them do. This particular desperate measure floated by Trump is novel, but he is not the first Republican to advance the idea that usual concerns about prudence and risk can be thrown out the window because the country is already a smoldering garbage fire. 1.) 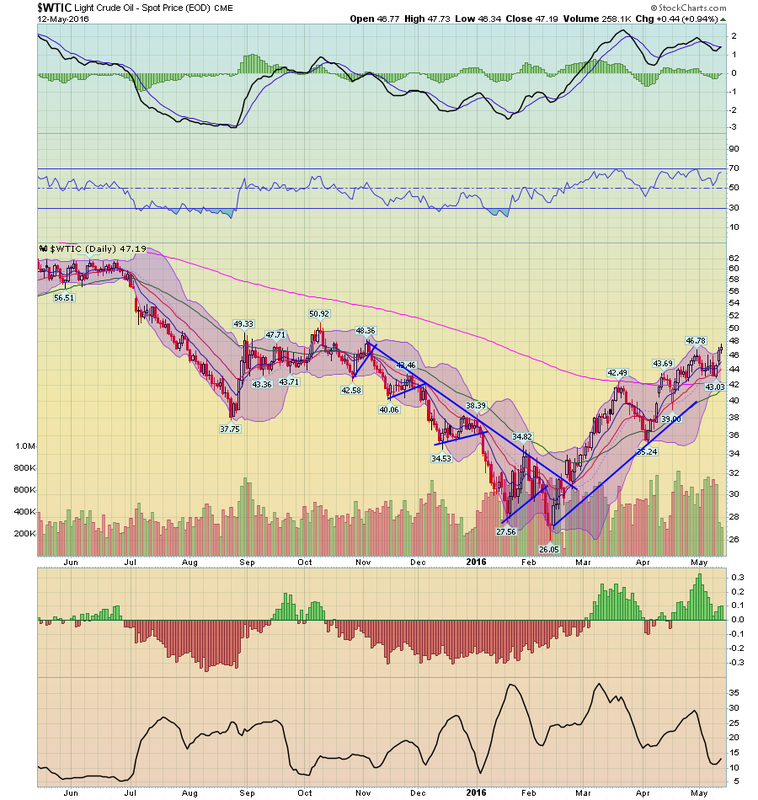 Prices moved above the 10, 20 and 50 day EMA. 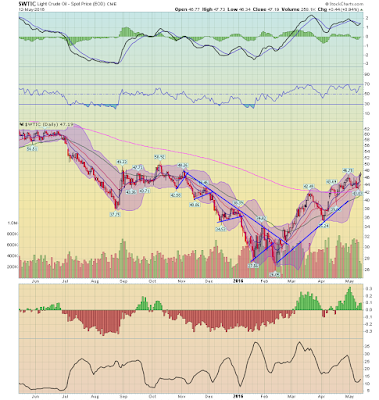 These averages will now provide technical support rather than resistance. 2.) 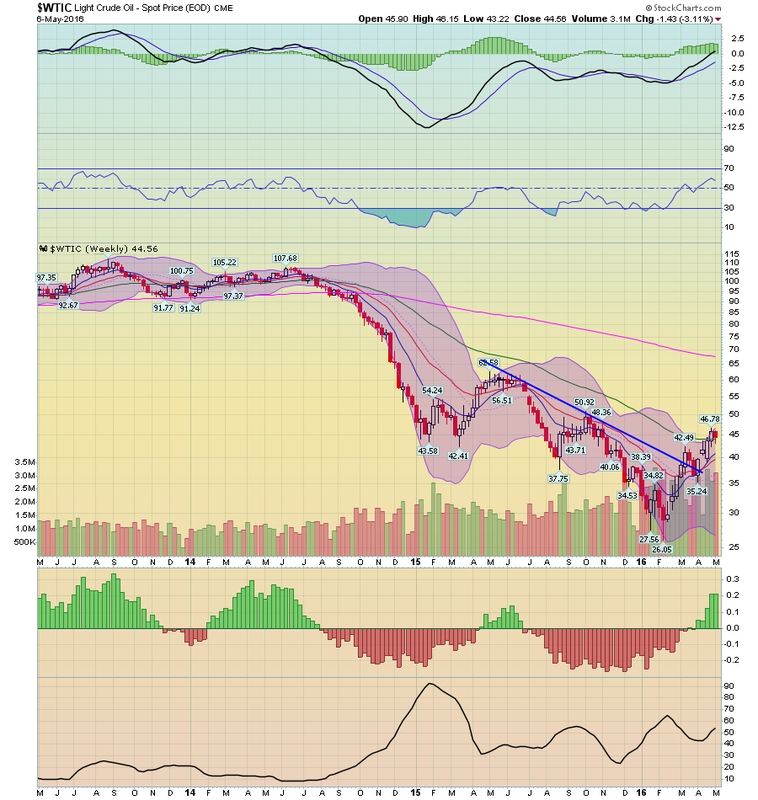 While momentum is still negative, it is rising and about to cross over the very important "0" level. 3.) Volume is high. 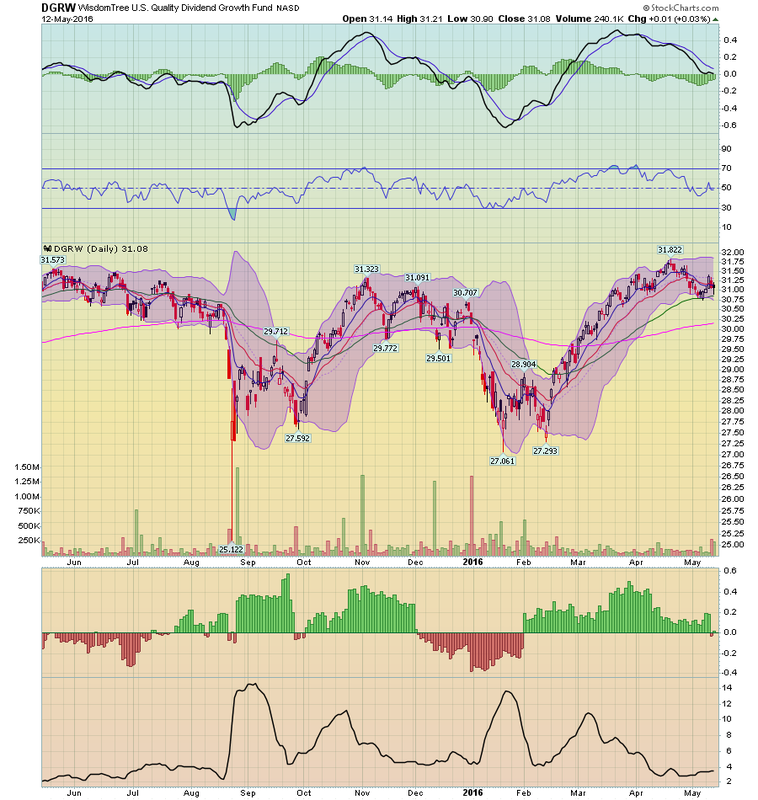 Volume spiked when prices fell into the mid-20s. This could represent a selling climax. 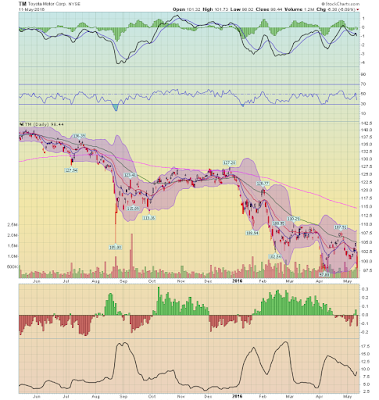 Additionally, volume continues to increase as prices climb. 4.) Prices moved through the downward sloping trend line that that connects the mid-2015 and 4Q15 price highs. 5.) 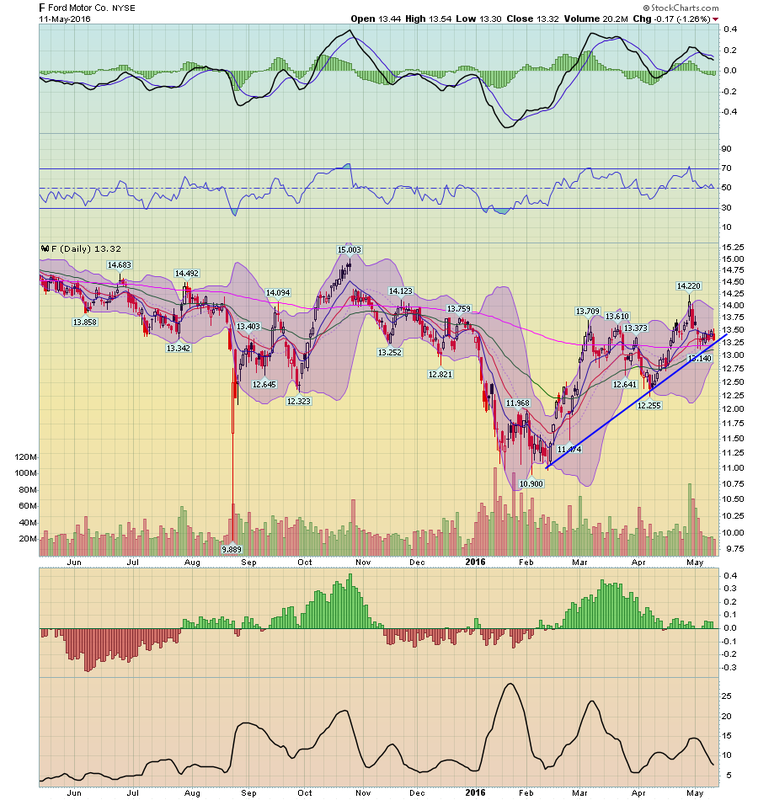 Prices remain in an uptrend. 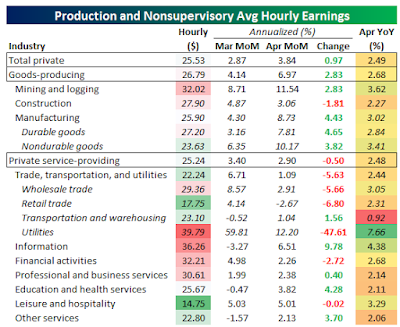 The news provides more evidence that the US macro trend is off to a sluggish start in the second quarter, but it’s premature to assume the worst via today’s data. 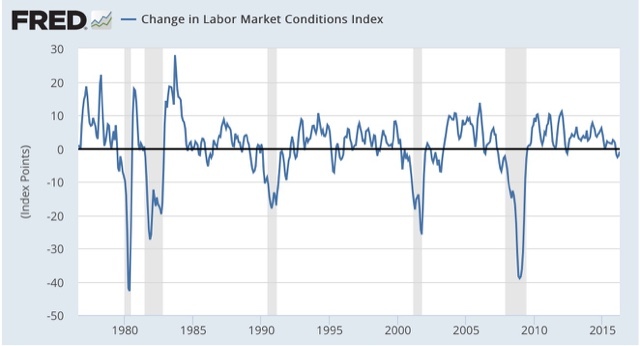 The labor market’s expansion has been decelerating this year, but for the moment the downshift doesn’t exceed the low points of the last several years. In short, we’ve been here before and without sinking into a new recession. Will it be different this time? No one knows, but the worst you can say at the moment is that we’re knee-deep in another soft patch that may or may not lead to a new downturn. 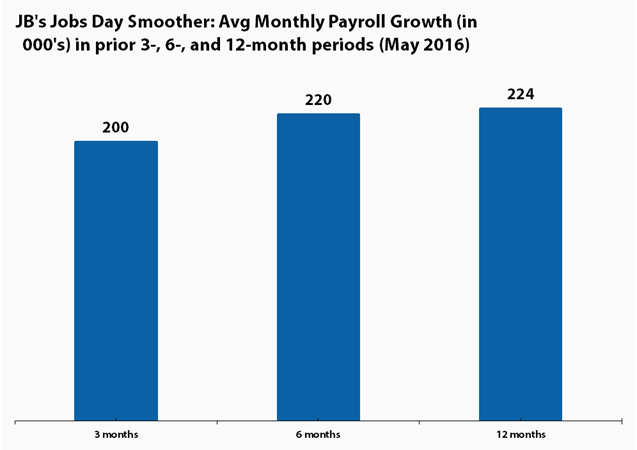 On the plus side, private payrolls are still growing at a healthy annual rate, rising by nearly 2.2% in April vs. the year-earlier level. 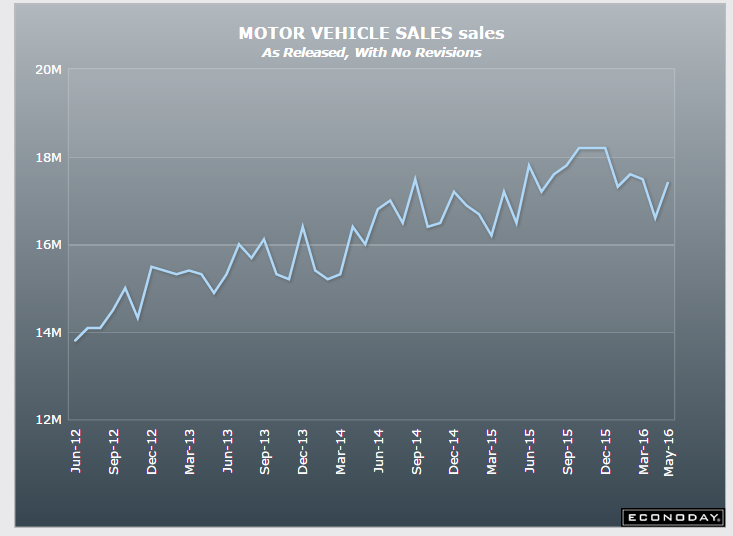 That’s a robust trend… if it holds. The problem is that the annual pace has been edging lower for much of the past year. But let’s recognize that the slowdown is unfolding in slow motion, which implies that a sharp slide is nowhere on the horizon. In other words, the bigger concern at the moment is less about the economy slipping into a new NBER-defined recession vs. weak growth that becomes even weaker over an extended period of time. That may turn out to be an irrelevant distinction, depending on your personal finances and career path. In any case, the game of looking for a clear and distinct start to a new recession may fade into the mists of a post-2008 realm of warm and fuzzy macro trends subsumed by slow growth and unsatisfying job opportunities. 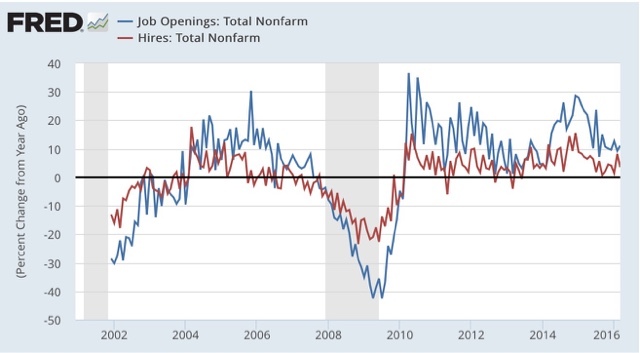 The jobs number is naturally volatile from month to month. So it's best to look at the change over several months or even a year. On a year over year basis, private sector jobs rose 2.2%; over the past six months, they are up at a 2.1% rate, which is about what they have averaged since mid-2011. Nothing much has changed. 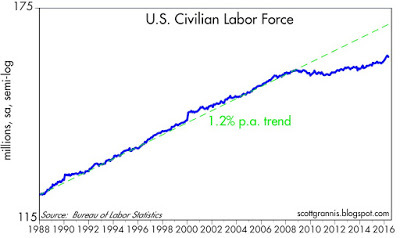 What has changed is the growth of the labor force, which has picked up of late. That explains why the unemployment rate has stopped declining: on the margin, more people are deciding they want to work. This is a positive development. Although the headline number for job creation was below expectations, this was still a decent report. Some positives include more wage growth (see below), fewer part-time workers for economic reasons, fewer long-term unemployed, and a decline in U-6 (an alternative measure of underemployment). 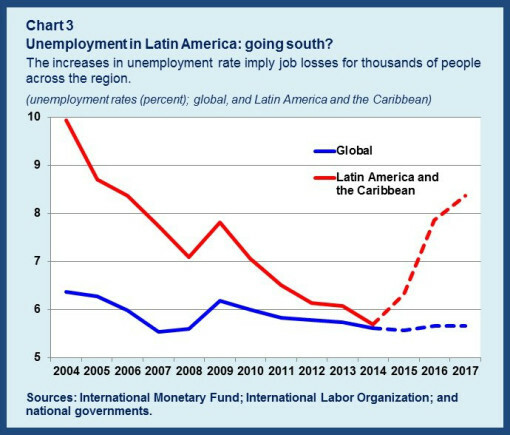 However, though this slower pace could represent a downshift in the rate of job creation, it is far too soon to jump to that conclusion. These monthly numbers are jumpy and require averaging a few months’ gains to get at the underlying trend. In fact, the monthly trend over the past three months is precisely 200,000, as shown in my monthly smoother below. So, even while one can point to other slowing indicators, especially the 0.5% GDP growth in the first quarter of the year, do not assume the job market is softening. 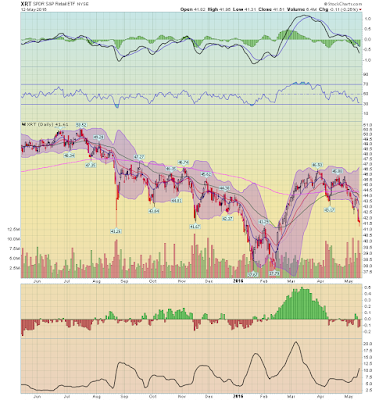 The rest of the report provides indicators that bounce both ways. 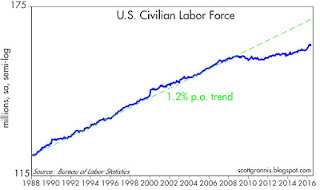 On the soft side, the slipping of the labor force participation rate was a real disappointment and a reversal of a recent upward trend in this closely watched metric of movements in and out of the labor force (see figure). 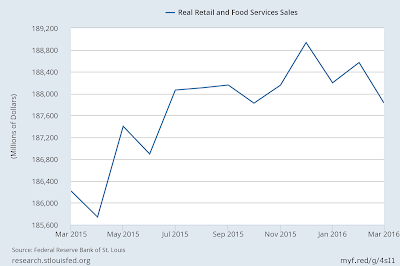 After rising from a low of 62.4% last September to 63% in April, the LFPR ticked back down in May to 62.8%. That’s still significantly off its lows, and again, the monthly numbers are jumpy, but this was the number I liked least in today’s report, especially since the same 0.2 percentage point decline was seen among prime-age workers, meaning the drop can’t be pinned on aging retirees. 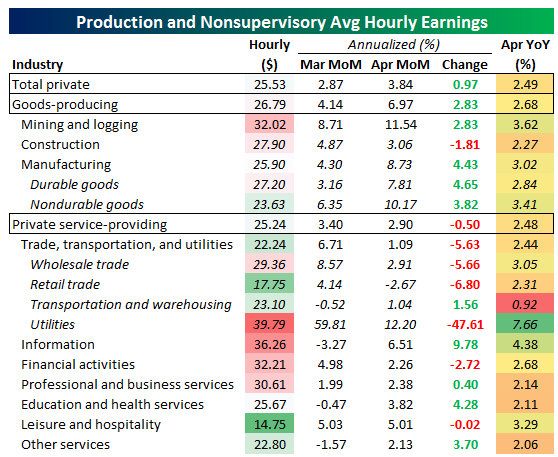 On the other hand, both average hourly wages and weekly earnings continue to beat (very low) inflation (weekly hours ticked up slightly last month), with both earnings measures up 2.5% over the past year, while inflation’s running around 1%. Importantly, from the Fed’s perspective, even while the job market is tightening, the extent of wage acceleration remains mild. Essentially, average wages from the establishment survey have climbed from around 2% growth in the first half of last year to around 2.5% this year. That’s what we’d expect in an improving job market and a pace that remains below the 3-3.5% Fed chair Yellen has suggested is “equilibrium” wage growth.